Learning to Eat Allergy-Free: The Book is Coming! Have you noticed my updated website design? I thought it was time for a facelift because I have news – very big news!! I’ve been kinda quiet about this, because this is my first full-length book, and I wasn’t sure what to expect – but now that the book has a cover and is available for pre-order at Amazon and other publishers – well, I guess it’s time for an official announcement. 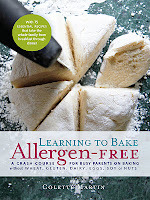 Learning to Bake Allergen-Free: A Crash Course for Busy Parents on Baking without Wheat, Gluten, Dairy, Eggs, Soy or Nuts, will be published by The Experiment in April, 2012!! Check out my new about the book page to find out the whole scoop and options for pre-ordering. What do you think of the cover? I think Susi Oberhelman, the cover designer, did a fabulous job on it, don’t you? I can't wait until I can actually hold the book in my hands and share it with you!! Yes, I did notice the update and CONGRATULATIONS!! Can't wait to get a copy myself!! Whoo hoo!! I am so excited for you and I don't even have an allergy to gluten!! This book will rock!! Have you sent an advance copy to Elisabeth Hasselback on The View yet??? Thank you all! I'm sure to be talking about it more in coming months. I'll definitely be buying! I've recently gone over to living gluten-free. I'm excited now! Mary, thanks! I hope you enjoy it!